Faizel Bagus: "My life has already found direction. It will bring peace and healing". Dr Enver Mia(Dentist): "I'm motivated to learn more about Hypnosis and use it in my practice". Dr Annette Kenwright: "The workshop was fantastic. Pulled it all together!". 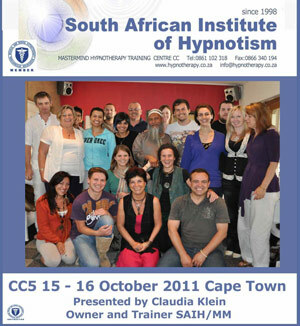 History of the South African Institute of Hypnotism and the Mastermind Training Centre. The South African Institute of Hypnotism (SAIH) was founded in 1998 - making it the most established institution of its kind in Africa, by Dr. Christa Hall-Sanford and Malcolm Hendry-Holland. Its training division is known as the “Mastermind Training Centre” through which it has facilitated the training of hundreds of professionals and amateurs in the field of Hypnotherapy in both Johannesburg and Cape Town. The founders' vision is still valid today “to acquaint students with the theory and application techniques of hypnosis and standardize and upgrade educational requirements for professional Hypnotherapists to the highest level of competence”. In March 2002 the International Medical and Dental Hypnotherapy Association, USA (IMDHA) accepted affiliation of the Institute and the training arm for its excellence in Hypnosis Education. SAIH became the first approved school in training of Hypnotherapy, Hypno-Anaesthesia, Painless Childbirth and Hypnosis in Dentistry in South Africa. In 2006, the UK based Association for Professional Hypnosis and Psychotherapy accredited SAIH and the Mastermind Hypnotherapy Training Centre as an approved hypnotherapy school and opens membership to its students and graduates. Christa and Malcolm appointed former graduates and established hypnotherapists as trainers in both Johannesburg. Claudia Klein in Cape Town, currently owns the business as of early 2007.